Do you have a small patio space? Worried that your patio would look too small, that it will create an uninviting feel towards your guests or even yourself? Your patio, no matter what its size, deserves your attention. With the right tools and proper planning, you can get the most out of your space! Small patio – no problem! You might want to incorporate colours into your patio. A couple of bright rugs and warm tone furniture may look great, but it can make your patio appear smaller. If your patio is small, try using neutral or light coloured items. It can make your patio look less cluttered and more organised. This will carry the eye beyond the property line – creating an illusion that your patio looks larger than it is.Are you worried about your security with a low fence? No worries, you can always install patio lighting to ward off any unwanted guests at your home at night. You can’t extend your patio anymore, so the solution to make it bigger is to create an illusion of it. You can leave the door open to create an unconfined feeling. Create variety with new levels, raised planters and steps that can lead the eyes upward. It can increase the illusion of space, therefore making your patio appear larger. Use mirrors to bring in the borrowed landscape from further down your garden, the neighbouring areas of repeat your own patio area. By removing the exact edges your patio will look and feel larger. Your patio can be a great space to relax and enjoy with family and friends, no matter what the size. Small can be cosy and intimate. If you need to upgrade or are still not happy with your current patio, contact CPR Outdoor Centre for all your patio needs. We offer installation services that include patios, garages and carports. Ring us today for a free quote. Call our Bunbury office on 9726 2311 or phone Busselton on 9754 2657 and speak to the professionals. When you are about to start a home improvement or renovation project, you are always faced with the question of whether you should do the project yourself or hire a professional. Today most building projects can be DIY, which means you can start from scratch yourself and not have to worry about the installation fees. However, is a DIY kit right for you or should you hire a professional? There is no definite answer to this question. Why? This is because the answer depends on your capability. If you are handy and understand the fundamentals of building and you have access to construction tools, go for it. You can build your own patio, after all, DIY patio kits are designed for DIY people – you should be able to handle it easily. Do you have mates that can help? Remember DIY projects take longer because you have to do everything yourself, from getting the building approval to ordering the concrete and picking up the DIY kit. Then there is the actual building or your new patio which will try up all your weekends or use up your holidays. Near enough is not good enough because you have to build your new patio to the council regulations, your patio will be inspected to finish your building permit. DIY patios take longer to build and in some parts of the building process you may need help to maneuver the large sections. Do you have suitably skilled mates that can help you lift the large sheets of roofing into place? If you answered yes to the above questions then a DIY kits for your new patio might be for you. If not then consider ordering a completely installed patio where everything is done for you. What About Hiring a Pro? Should you choose to hire a professional builder to erect your patio, go for it! A professional patio builder will do a better and faster job than you can. This isn’t about who’s better and who’s not, but a professional has been trained and will have their skills down pat. An experienced patio builder is your best bet if you want the project to get finished in a short span of time. If you go with the fully installed option then your patio installer will do everything for you from creating the perfect design to building approval, organizing the concrete or decking right through to the final inspection. Whichever way you choose to go for your new patio CPR Outdoor are the people to see. CPR Outdoor Centre supply DIY kits cut to size ready to install as well as full installation options. our Busselton office at 08 9754 2657. We are your professional patio builders and provide free onsite quotes, call and discuss your needs today. As some patios are built as an extension to your home depending on what side of the house they are attached to, you might need to have added protection from the sun and wind at certain times of the day. Giving your patio some protection will make your patio space more enjoyable and this means you can spend more time enjoying your patio area. There are quite a few options you can go with for wind proofing and this can also add extra appeal to the space too. If you are into DIY options, there are products on the market that can be cost effective but may not suit the style or fit to your patio so measuring the area is a good idea. An economical way to offer some protection is grow vines or certain creeper plants on latticework. This makes for a lovely shaded area and if fragrant flowers are part of the plant the perfume will waft throughout your patio space. Large pots with palms give a great look and make a good decoration piece for tropical themes. Extremely tough and durable material, canvas awnings can be a great barrier from a windy patio area, costs and designs will vary. Blinds can be installed professionally or often available as DIY to instal yourself. Clear PVC blinds till allows the view to be kept and can come with zips to connect the blinds to block out the weather elements completely. 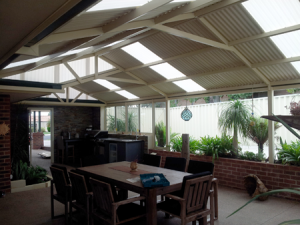 Great for a modern look, permanent structure and complete wind proofing that won’t affect your view. Panel or slats made from bamboo or wood are another way to provide protection from the elements and offers a great decoration piece under patio space. Looking for A Great Patio Space? CPR Outdoor Centre Bunbury 9726 2311 or Busselton 9754 2657.